I could not believe what I was hearing Christmas Eve 2009. I received a call to say I had been lucky enough to win the competition I had recently entered to practice Midwifery in Ghana! As I boarded the delayed plane it all seemed to still be a blur, I was on my way to Ghana! Africa; it all seemed a dream! I felt welcomed from the start as one of the Programme Managers met me at midnight and took me to a guest house where I was to spend my first night. The following morning at 5am I met Al Hassan who accompanied me on the 4 hour coach ride to Takoradi, my home for the next four weeks. Once at the house I was greeted by Joe and Ophelia and shown around the house and the local area. Orientation was of an excellent standard. After a well deserved night's sleep it was time for hospital orientation. 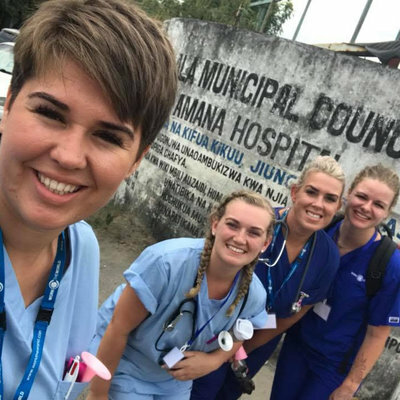 The hospital was busy with local nursing students taking their final exams and beginning practical placement, I was however very welcomed by all during this busy period and staff were only too happy to help, everyone was extremely friendly. The house is ideally located within a short walk of shops, the internet cafe and places to get mobile phone credit; everything you need to stay in touch with loved ones back home. A longer walk or short taxi ride away is Takoradi town centre, a vibrant place where you can get hold of most things, apart from real chocolate! The house itself is always clean and well stocked. Mosquito nets and fresh bedding is provided and purified water is always available. Food is prepared in the morning by Ophelia, as is a hearty dinner of traditional Ghanaian food. A weekly Barbeque provides an evening of entertainment, drinking and dancing. Fante is the local language in Takoradi and lessons are provided on a weekly basis, making interaction with the locals a little easier. Although English is the first language of Ghanaians, everyone enjoys the fact that the obruni's (whites) are making an effort on a local level. I spent three and a half weeks in the regional hospital in the Sekondi area of Ghana's Western region. I was welcomed from the onset and spent the majority of my time there interacting with staff members and offering support to labouring women. Due to the facilities within the hospital it is not possible for a woman to have anyone with them during labour, so from admission - although midwives are available - the women are left to progress alone and in silence until they request to bear down. They are however monitored regularly and observations charted on a partogram. Paperwork is kept to a high standard. Being there for the woman and interacting with her as we would in the United Kingdom encouraged questioning from the local staff as to why? They were however encouraging towards the support given to the women by the students and were as interested in finding out how we gave care, as well as giving us extensive information as to how things worked over in Sekondi. Antenatal care is free to all pregnant women up to six weeks postpartum. The care given and regularity is much similar to within the UK. There is a high prevalence of women with anaemia in pregnancy, and recommendations given to incorporate green vegetables in the diet to prevent this. Women get one dating scan, however gestation for this varies as do free appointments, ultrasound monitoring is given more frequently in multiple pregnancies. Pain relief in labour is rare and only used when a woman brings it to hospital with her, it is common however for woman to rely on religion as a focus during pain; it is not uncommon to hear a woman praying to Jesus for help. Most primiparous women are given locals without anaesthesia, however they are usually given local anaesthetic for suturing. Spinals are routine for caesarean sections. Care does not allow a woman to eat in labour however the hospital provides a malted Guinness (non-alcoholic of course) drink that is full of nutrients to keep a woman's strength up. A woman brings everything she requires for herself and her baby into the hospital as family are not readily accessible until the woman has delivered. 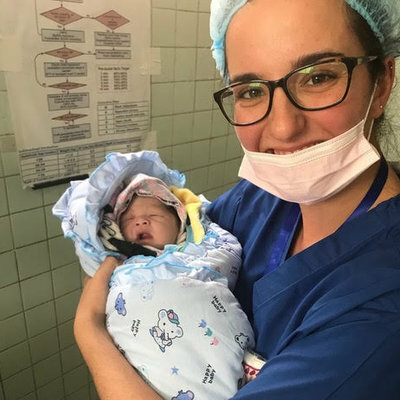 She provides plastic sheeting and sheets for during labour and items in which to wrap the baby afterwards, as well as bleach that is used to sterilise the equipment used during delivery. The women will not see her family members until after she has had her baby. Women are discouraged from making any noises during the second stage of labour due to the openness of the ward area and the fact that there are often other labouring women within close proximity. It is not uncommon for midwives to shout and lightly hit women who breech this request. 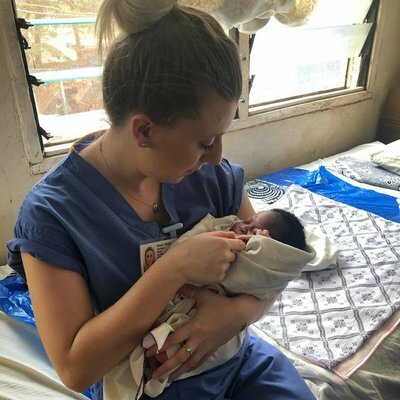 Although the midwives advised me I had missed the peak of deliveries (apparently summer is the busiest) I still managed to observe quite a few deliveries and a couple of caesarean sections and felt my time in Ghana was worthwhile. I felt although I learned a lot during my trip to Ghana, due to the difference in care over there, some aspects will be more easily put into practice within the UK than others. I went to Ghana with an open mind and was not disappointed by my experience. Every moment was breathtaking, some in different ways to others... It is not every day a woman names her baby after you! I have left Ghana feeling educated by the cultures and traditions I had encountered on my trip and proud in the fact I had, if only for a little while, made that special touch on a woman's life! I would LOVE to return to Ghana one day, however in the meantime, I recommend it to anyone who is taking an elective. I felt totally safe and supported my whole trip; I just feel that four weeks just wasn't enough!